Listen to Archana Doshi of Archana’s Kitchen on her important learnings and how it helped her to aid her business. Archana Doshi is famous as a youtube star and kitchen queen and needs no introduction. Her motto of presenting recipes which contribute to fit and healthy lifestyle has been receiving tremendous love. Wondering what makes her space, Archana’s Kitchen, an exclusive one? Archana says that her sole focus is the ‘customer’ and what she/he wants to know about food and cooking. When starting a business, implementing one’s ideas has many directions. While it is required to bring out the best in you as an entrepreneur, simultaneously it is imperative to understand what exactly a customer wants. Is it just the recipes that they are coming for or a twist to a basic recipe, or shortcuts for cooking, or planning for a party menu or wondering which kitchen appliance to buy? We all have different needs when we explore the sea of recipes online, don’t we? However, this doesn’t apply just to recipes, in fact, to every other business out there – there are customers with different needs. And Archana’s Kitchen focuses right on this point! It might not be an out of the box idea when it comes to your business, but turning it into a unit which strives to meet the demands of the current world is what keeps you in a desired position in the market. Even for a kind of business whose presence is just online and is not meeting a customer personally, it is still important to make a connection. Though it sounds that you are talking all the time, other things like – understanding the trends, giving tips on how to make best use of the information that you provide, asking for feedback, sharing with a bigger audience, acknowledging the requests, responding positively, etc. will all go a long way in making it a complete conversation of sorts. When you reach this stage, the communication would never look as one-sided and you are bound to form a loyal community of customers. We were pleased to have Archana Doshi as a speaker at our last Breaking Barriers event where she shared her ideas on marketing, which inspired many other women entrepreneurs to keep up the right strategy in their own businesses. 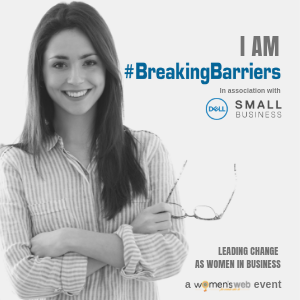 Come, join us at our next Breaking Barriers event for more such inspiring ideas and to meet like minded women entrepreneurs.